There’s a lot of talk about the real estate market today and I’m excited to see what 2018 holds. Here’s what I’m seeing from 2017 along with predictions for 2018…. Always hand-written with stats direct from our local MLS. Total sales volume is down a little at 3.2% over last year, but bear in mind that inventory has declined 20% over last year. In light of a notably larger drop in inventory, this 3.2% drop in total sales is actually impressive and signals a relatively stronger pool of buyer demand than we have seller inventory. How low can it go? Seriously, i find myself asking this question again this year in January after another precipitous fall at the end of Q4. We’ve seen a drop in inventory of about 20% year over year for 3 years now. The downward trend is clear for 5-6 years straight. 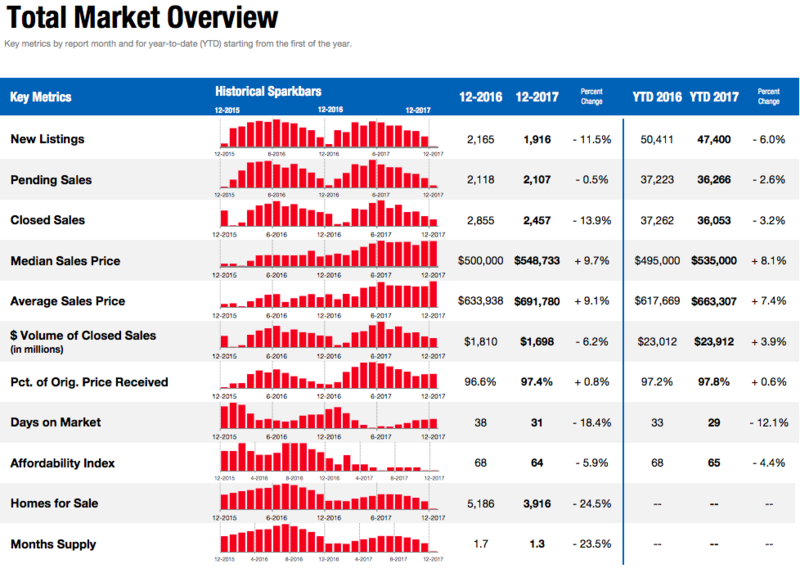 The seasonal norm is that we have the lowest inventory at the end of the year so that’s where we are at – the lowest total inventory of homes for sale in over 10 years. I’ve discussed in article’s past that the minimal building being done locally and statewide the last 10 years has not kept up with a rising population. Rental vacancies have also been at all time lows for years now. Simply put, we have a housing shortage. This is fueling price increases. Rates started the year around 4.20% (MND average), went down and back up in Q1, but then slid slowly down for the next 2 quarters. 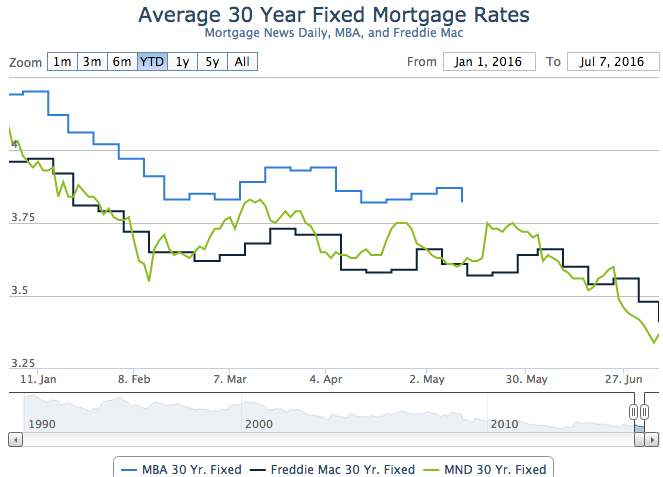 Rates hit their yearly low of 3.84% in early September and then crept back up to end the year at 4.04%. However the real rise happened in January and rates are currently sitting at 4.37% on Feb 6, 2018. 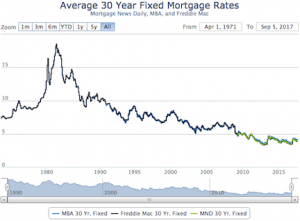 Most lenders have been expecting rates to go up for years, but they keep dropping back down for one reason or another. 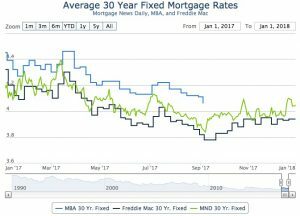 It is a very common trend for rates to rise at the end of the year, but this time, all the lenders I’m speaking with are expecting rates to stay higher all year. The fed raised the Federal Funds Rate 3 times in 2017 as well as once at the end of 2016. Clearly the Fed believes our economy has stabilized enough to start raising the Fed Funds rate. Right now, they are swearing in a new Fed Chair, Jerome Powell, to replace Janet Yellin, so I think a lot of people are wondering if we will see many changes from the new Fed chair. We’ve been well below the 2% inflation mark for some time now. I believe more notable inflation is coming our way and that the Fed will react by raising the fed funds rates further. Tax reform is another big change just pushed through congress. I sent a special email to my past clients on this one in January, but the basic effects are going to be a mixed bag in my opinion. Most people in San Diego will see a decrease in real estate write-offs with the new tax bill, especially in the lowest price ranges (under $250k) and those with a home valued in the $600k+ range. The low price range will lose it’s write-off benefit because the standard deduction is doubling, in essence wiping away the usefulness of owning the very entry-level homes. The state income and local/property taxes are now capped at $10k. Those who bought years ago and have lower property taxes & lower loan amounts will benefit more than new purchasers with higher property taxes and/or higher income. Lastly, the mortgage interest deduction cap was lowered from $1mil to $750k, so people with loans in that price range will be negatively effected. But on the bright side, everyone will benefit from lower income tax brackets and some will benefit from the corporate tax breaks directly/indirectly, the child tax credits, or other little loopholes such as opening the 529k college savings plan to private elementary/secondary schools. Price is a balance between supply and demand. Activity as a whole has gone down slightly (3.2%), but Supply has gone down noticeably more than sales (20%). Thus, we have seen a pretty consistent rise in home values all year with a rolling 12-month average of about 8%. Seasonally, market prices usually peak near the end of the 2nd quarter, but this year we saw a big push in the last 2 months of the year with median values peaking in November and December. Our extremely low inventory is the number one reason to be bullish on our local real estate market. A faltering stock market, unpredictable politics, a jump in home loan rates, tax uncertainty and/or low affordability may have a few people sitting things out, but there’s still more people wanting to buy than there are sellers. If you look at the “Months supply” on the above chart, you’ll notice that’s trending down (about 20% on rolling monthly average). Month’s supply is a basic representation of the supply/demand curve. It’s clear that demand continues to outpace supply and that’s why prices rose all year. Low inventory is why prices will continue to rise in 2018. As I write this, the first month of the year feels pretty active, which I have corroborated with other brokers and title reps. Both of my listings in January went quickly for good money. And I received a few additional referrals and website inquiries from new buyers, showing that the spring season should be fairly active. I’m still projecting a 3-4% gain this spring in home values, but I am going to go out on a whim and predict that inventory levels will start to stabilize by the end of the year and stop dropping so precipitously. I don’t know what to expect for home loan rates this year, but i can tell you that we are still near historically low rates, so we have more upward than downward potential IMO. I’m guessing the next quarter will be somewhat volatile, but that rates will generally go up/down evenly.